Welcome to the first and only web site on sightseeing of Skopje by bicycle. Skopje is an amazing city, incredible mixture of different nationalities, cultures, religions, buildings dating from Roman Empire, through medieval age to modern time. This city is a mixture of churches, mosques, monasteries, hamams, colorful nature and hospitable people. Skopje is the capital of the Republic of Macedonia and about 1/3 of country's population lives here. It had been inhabited since at least 4000 BC. In 1392 the city was conquered by the Ottoman Turks and they named the town Üsküp. Skopje had been under Ottoman control over 500 years. At that time the city had been famous for its oriental architecture. In 1944 it became the capital city of Democratic Macedonia (later Socialist Republic of Macedonia), which was a federal state, part of Democratic Federal Yugoslavia (later Socialist Federal Republic of Yugoslavia). The city started to develop fast after the Second World War, but most of it was destroyed when Skopje was hit by a disastrous earthquake. This is the main reason that there are just a few 19/20th century buildings in Skopje. In 1991 Skopje became the capital centre of independent Macedonia. City bicycles rented from a public company are used for this tour. Bicycles' prices are included in the price of the tour. This tour is available from Monday to Friday between 4-6 p.m. and 6 -8 p.m. and on weekends and national holidays from 8 a.m. to 8 p.m.
A minimum of three (3) people is necessary to arrange this tour. 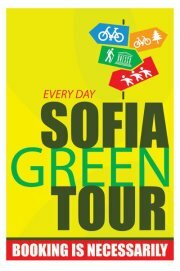 This tour is available from Monday to Friday between 4-8 p.m. and on weekends and national holidays from 8 a.m. to 8 p.m. This tour is available on weekends and national holidays only, from 8 a.m. to 8 p.m.